Bangladesh Bank published the 94th prize bond result 2019, 1st prize winner number is 0609454 !! On January 31, 2019, the Bangladesh Bank has published 94th prize bond draw result 2019 in the official website www.bb.org.bd. In the initiative of Bangladesh Bank, the Prize Bond Draw 2019 program held in the Dhaka Commissioner’s conference room. After that, the prize bond draw, the result published on the Bangladesh Bank’s website www.bb.org.bd. In the last 94st Prize bond draw’s 1st prize of 6 lakh taka owned number is 0609454 of the 53 series of this lottery number 2nd prize of 3 lakh 25 thousand taka owned number is 0082870 of the 53 series of this lottery number. 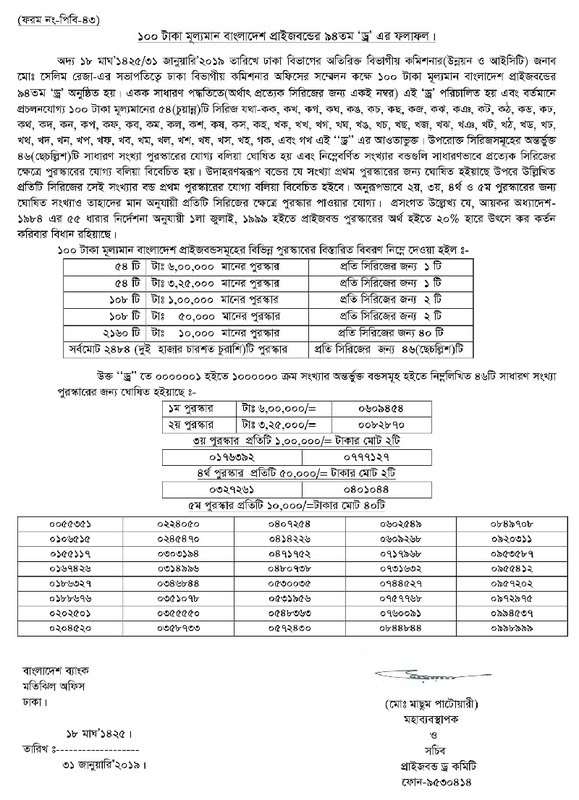 Apart from this, the details of prize bond result 2019 can be found on our website result.planetbangla.com. Apart from the National Savings Directorate’s website, you can also see and download the Lottery Draw Result 2019. Prize bond prizes for the total 53 series were declared equally. A total of two thousand four hundred and thirty-eight financial awards were announced in 53 series where each series was 46 prize. This draw is run as the same number for each series in the general way, for each series. Starting from “কক, কখ, কগ, কঘ, কঙ, কচ, কছ, কজ, কঝ, কঞ, কট, কঠ, কড, কঢ, কথ, কদ, কন, কপ, কফ, কব, কম, কল, কশ, কষ, কস, কহ, খক, খখ, খগ, খঘ, খঙ, খচ, খছ, খজ, খঝ, খঞ, খট, খঠ, খড, খঢ, খথ, খদ, খন, খপ, খফ, খব, খম, খল, খশ, খষ, খস, খহ, গক—include the draw” in 53 series of 100 Taka prize bond number was included in this draw. What is the prize bond? To increase the tendency of saving money, the National Savings Division announced a prize bond called “Bangladesh prize bond” in 1972. It’s also called a lottery bond. Any person can buy as many lottery tickets as they wish. This lottery ticket is not a lottery ticket for the other lottery like Jodi Liga jay. And anyone can easily exchange money at any time by his ticket. You can also buy prize bonds from Bangladesh Bank, Commercial Bank and Post Office and sell it if you like. The results of Bangladesh Bank Prizebond draws are held every year on January 31, 30th April, 30th July, and 31st October. Each series has 1million prize bonds and there are a total of 53 series. If a number of a series win prize money, then the same number of each series will get those rewards. If you are a fortune winner of a lottery winner, you will have to inform the bank and the bank will give you a form. After completing the form, you get the reward money within 2 months. But the government will have to pay 20% tax on your reward money. In 1956 Priyomand was first introduced in Ireland. In Bangladesh, the first prize bond of Tk 10 and 50 was introduced in 1974. After the launch of prize Bond of Tk 100 in 1995, the valuation of 10 and 50 Takas was withdrawn. The Draw of prize bond of Tk 100 is held four times a year: 31 January, 30 April, 31 July, and 31 October. A committee comprising the chairman of the Dhaka Divisional Commissioner is conducting the draw ceremony. But after two months of purchase, the prize comes under the drawer. The award money can be claimed for two years of the draw ceremony. If anyone does not claim it, then the money of the reward will be returned to the government treasury. After winning the application, in the prescribed form with the original bond, the pay order is given to the winner within two months. But a tax on the prize money is 20 percent deducted by government. By selling prizebond, the government directly receives loans from the public. In India and Pakistan there are eight types of prize bond worth 100 to 40 thousand rupees, but for 20 years in Bangladesh, there are only 100 takas worth prize money. There are 44 million pieces of pricebond in the country and the Bangladesh Bank has done all the work beyond of Government of Bangladesh. For any other educational information, Result News, Jobs Circular and as well as all type of usefull information you can visit our site planetbangla.com. Also we provide all update of national Prize Bond Draw information and international prize bond draw informatin from our website. So please continue visit our site for more Prize Bond draw Update update.